I finally cleaned up my studio enough to take pictures! My mom is also a ceramic artist, and after graduating and moving home to Boca Raton, we spent most of the summer cleaning and organizing our garage, and making plenty of trips to Goodwill and the city’s recycling facility! 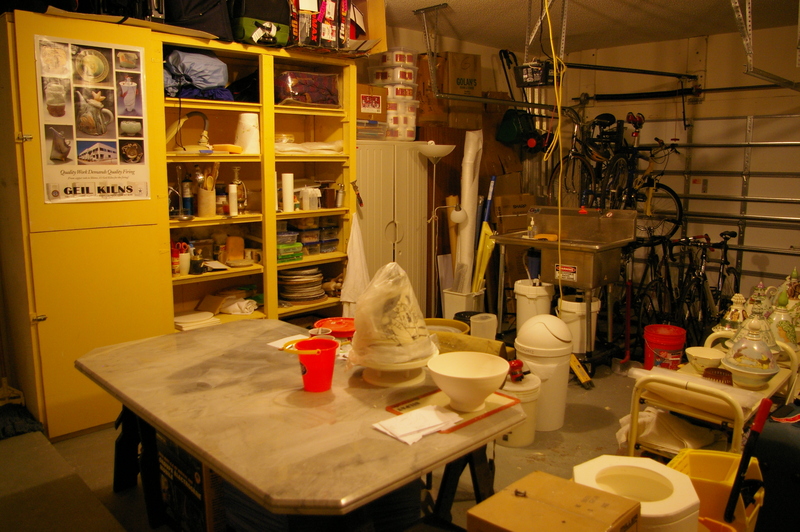 We turned half the garage into a fully-functioning ceramics studio, complete with a wheel, wedging and reclaiming tables, hand-building table, clay sink, wet box, and plenty of shelving for our tool collection. 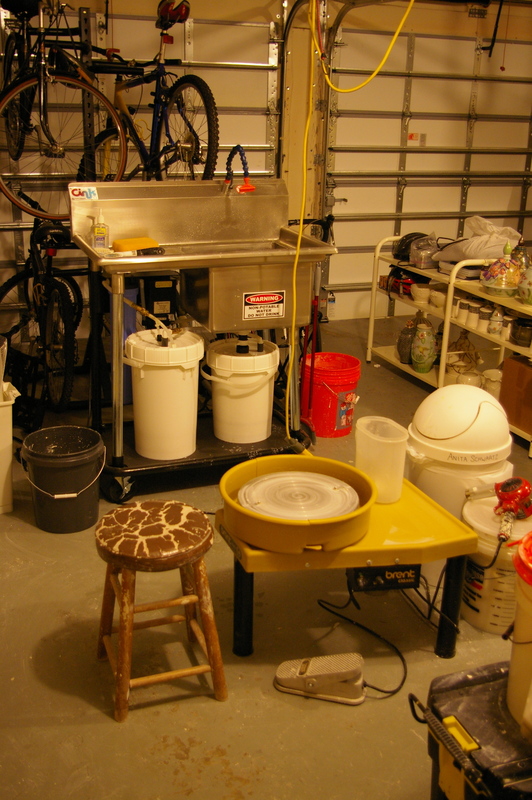 The Model C is recommended for both schools and professional potters. It centers 75 pounds of clay with a 3/4 hp, 7 amp motor and has a reputation for mechanical efficiency, long life and quiet, vibration-free dependability. The 14-inch cast and machined aluminum head runs on permanently sealed double row ball bearings. Our wheel and clay sink. This shelving unit was a DIY project from the previous owners of the house, and before we spent an entire day painting it bright yellow and removing most of the doors, I was a little creeped out by it. Thankfully, there were no dead bodies inside it (except for some earwigs) and it now makes the perfect storage space for all of our tools. 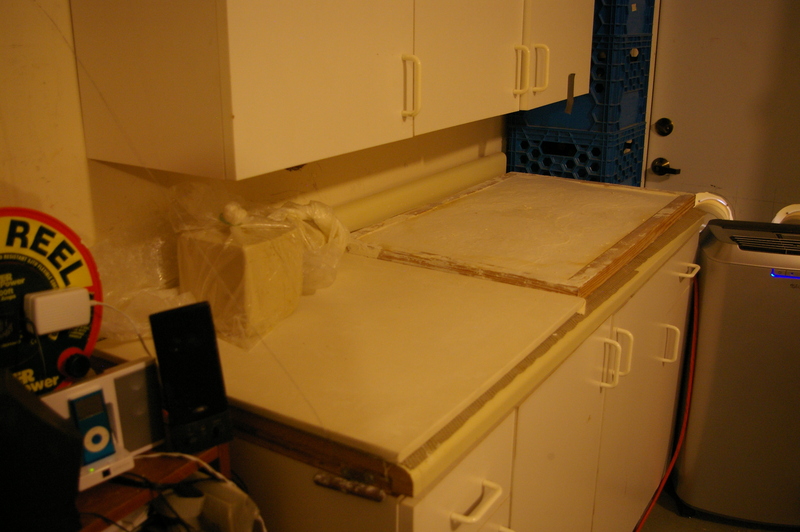 On the left side, we left the doors on it, and coated the inside of the cabinet with thick sheets of plastic. 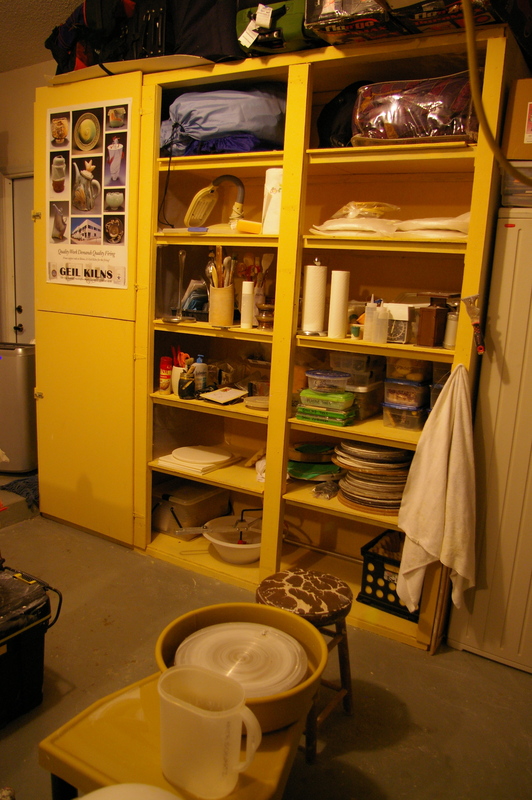 This is our wet box, where we keep works in progress and store our pieces in various firing stages. For our wedging table, I stretched a piece of canvas over a piece of plywood. Next to it is a wooden frame that we filled with plaster for reclaiming clay. We also bolted an old cutting wire from the wall to the edge of the counter for cutting clay. This entry was posted in 1 by clayallie. Bookmark the permalink. It’s so nice to take a peek into your studio. Thanks for sharing. I wish you the very best in all you do. I know that you are truly blessed and will be sucessful in all your future endeavors. Reach up and out!!! Only reach down when you are “picking up” your art! Create. Laugh and enjoy!